Do you recognize that knock? “O God of Heaven, we beseech thee on behalf of our brother, Peter, that you would do a miracle and release him from the prison where he is being carefully guarded . . . .” The fervent prayers of the small house church rose into the night. A number of them had gathered at the home of Mary, the mother of John Mark, to pray for the apostle Peter. Recently King Herod had begun to arrest some of the Christ believers in order to mistreat them. He had taken James, the brother of John, and put him to death with the sword. Still reeling from this tragedy, they had been informed that Peter was now under arrest waiting to be brought before the people after the Passover holiday was over. Tomorrow was the final day and Peter would be brought out and killed. The new church gathered once again to beg the Lord to spare their brother in Christ. “O, great and powerful God, we know that you can do all things. Please spare Peter from the same fate as James. Bring him back to us so your message can continue to go forth . . . .” The prayers went on and on into the night. Meanwhile, in the prison, Peter, chained between two guards, was sound asleep. Sixteen soldiers were hired to guard him so that there would be no way he could escape or be rescued. The prison was under such tight surveillance that security cameras could not have done a better job. Suddenly Peter felt a strong slap on his side. He cracked his eyelids to shield them from the intense light that filled his cell. “Get up quickly,” a strong voice commanded. Realizing the chains had fallen from his wrists Peter groggily stood to his feet. “Get dressed. Put on your sandals and cloak and follow me!” the voice continued. As if in a dream Peter followed the angel through the corridors, carefully stepping around the oblivious guards. When they came to the iron gate that led to the city streets it opened for them automatically like the door at the market. They continued down the street while the cool air revived the released prisoner to his senses. He glanced around for his angelic guide but with a flash he was gone. Peter was left alone in the dim light. Gently touching the chafing marks on his wrists, he began to recollect what had happened. 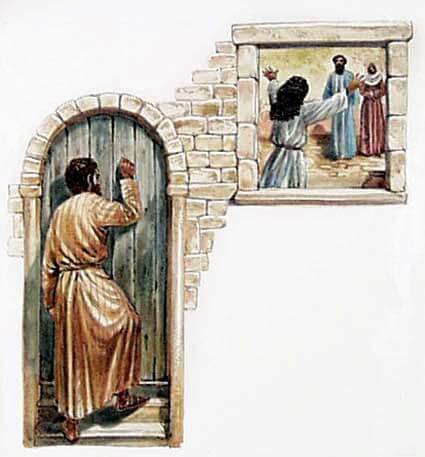 “Now I know for sure that the Lord has sent forth his angel and rescued me from the hand of Herod and from all that the Jewish people were expecting.” Realizing the miraculous escape that God had superintended, Peter headed to Mary’s house where he knew the church would be praying. Suddenly there was a knock on the gate. While the prayers droned on, the servant girl, Rhoda, timidly went to answer the summons. Upon reaching the portal she squinted her eyes to adjust to the dim light. A manly form took shape and upon hearing the request for entrance she recognized Peter’s voice. In the thrill of her joy Rhoda forgot to open the gate but ran back in to tell the others. Rhoda continued to insist that Peter was alive and well, knocking at the gate until they all rushed to the entrance. They threw open the door and were amazed to see the object of their fervent prayers in the flesh. Peter motioned them to be quiet. They all reentered the prayer chapel where Peter described to them God’s divine intervention. He then told them to explain to James and all the other brothers what God had done as he slipped out into the night to find safety in another place. What are you earnestly praying for? Will you recognize the answer when it knocks on the door?